The Vitality Stadium had 3 stands in 2003 when I first visited but with the addition of the new Ted MacDougall stand the stadium now looks almost complete. The new stand does have a number of pillars across the front of it so hopefully this will be improved in the near future. The remaining three stands were all built in 2001 over the course of approximated 4 months. Visiting supporters are housed in the far right of the East Stand where up to 2,000 supporters can be accommodated. 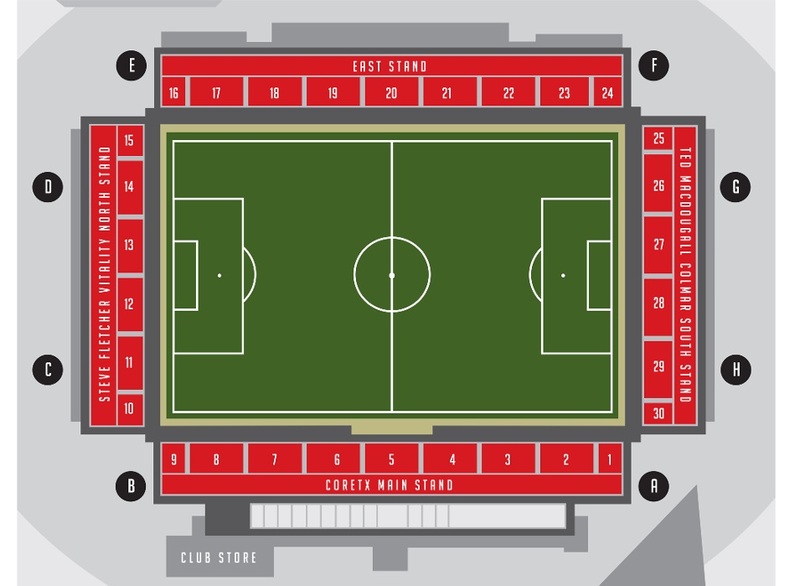 The area is all ticket for every game with fans needing to either get a ticket before they travel or buy a ticket from the Ticket Office located all the way around the ground in the Main Stand. It is a crazy system we know and hopefully the club will be reviewing it soon to make it easier. But in the meantime allow plenty of time before the game to buy a ticket. For fans walking from the main station in Bournemouth, there are a number of pubs ideally situated on the main road (Holdenhurst Rd) that leads to the ground. If you've parked your car in the council car park in Kings Park, simply walk out of the park (the way you came in) and turn left. The Portman Hotel is another popular haunt for Cherries fans and away supporters alike. The pub has a lot of connections with the club - in 1910 the football team used to use the back room of the pub as their dressing room! Today, the pub has been used as a venue for supporters' meetings and there is a fair bit of AFCB related memorabilia on the walls. Parking is freely available with 600 spaces on site in Kings Park. It is a council car park however and is pay and display at all times, although prices are very reasonable and parking tickets are very common so it's a small price to pay. Alternatively, there is a limited amount of street parking spaces within a 10-15 minute walk of the stadium. In my opinion however, it's not worth the extra walk as it rarely takes any time to exit the car park at the ground after the game. The nearest / closest train station to Bournemouth's Vitality Stadium is at Pokesdown although not all trains stop there. Bournemouth Central Station itself is only a mile further away and a twenty minute walk from the ground. As you come out of Pokesdown station, turn right and walk up towards Boscombe. Take a right into Gloucester Road (3rd on your right) and follow the street until it leads you into Kings Park. You should be able see the ground from there. Travel: It's a long old drive from up north but …the ground is signposted as soon as you reach Bournemouth, though all the signs direct you t the club car park behind the Ted McDougall Stand…Id recommend searching a bit further afield for parking because its an absolute nightmare getting out after. Refreshments: Location likewise isn't the best, there is more places to eat and drink if you are coming from Pokesdown Station (as I found out when I drove all around the world getting out of the car park!) Having a walk around to Boscombe looking for food before the game, there really isn't a lot, I ended up going to a cafe in the nearby shopping centre, as I never passed anything else on my way there, just the one little cafe in the park next to the ground. Impressions: The ground has been completely rotated and redeveloped since 2001, and now has 4 sides after the building of the Ted McDougall Stand last summer. That stand is a bit more temporary in nature with a couple of pillars, while the other 3 were all built together and are pretty uniform single tier stands. Anything Else: There were a few anti-ITV chants comically, due to some ticket holders being moved for the Liverpool game in the FA Cup next week so that ITV can get their cameras in! Enjoy: Not a fan, pretty dull ground overall, miles away, and a fairly dull location. Atmosphere is its most redeeming feature. Have you been to Bournemouth's Vitality Stadium. To tell us about your experiences and to feature on the site, simply complete the fans review form below! Special thanks to Debbie (smudge92.blog.com) for providing some of the photos below!